Cyclops, Phoenix and Nightcrawler arrive in a seedy New York neighborhood in search of the second recently-detected new mutant. Leaving Nightcrawler to keep watch outside, Cyclops and Phoenix enter a rundown disco, not knowing they are being watched by the Hellfire Club. 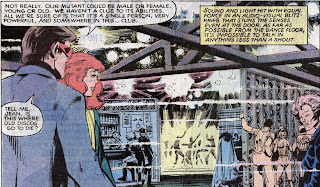 As they search the disco for the new mutant, the Hellfire Club mercenaries check in with Sebastian Shaw and Jason Wyngarde, members of the club's secret Inner Circle. Wyngarde departs for the disco while Shaw checks in with the White Queen in Chicago. 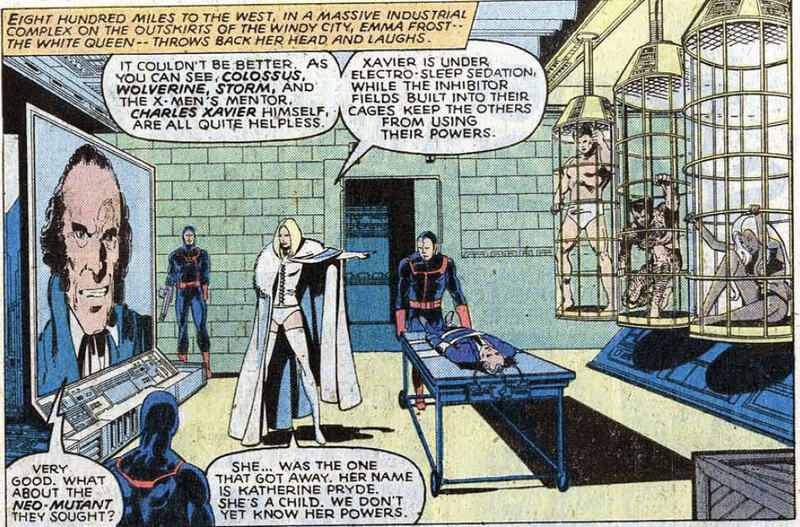 White Queen reveals that she has captured Professor X and has Wolverine, Storm and Colossus locked in power-inhibiting cages. Unknown to her, the stowed-away Kitty Pryde phases into the room, and manages to awaken Storm. She gives Kitty a number to reach the other X-Men, and, discovered, Kitty flees, using her power to dive through the floor and escape a pair of guards. Back at the disco, Phoenix bumps into Jason Wyngarde, and suddenly finds herself back in the 18th century once again, where she is about to marry to Wyngarde. 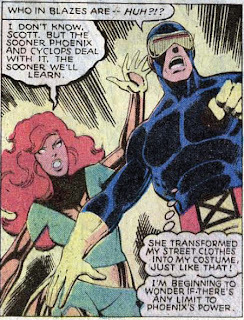 Following the ceremony, Wyngarde announces Phoenix as the Black Queen of the Hellfire Club and passionately embraces her, an embrace that is echoed in reality, much to Cyclops' shock. 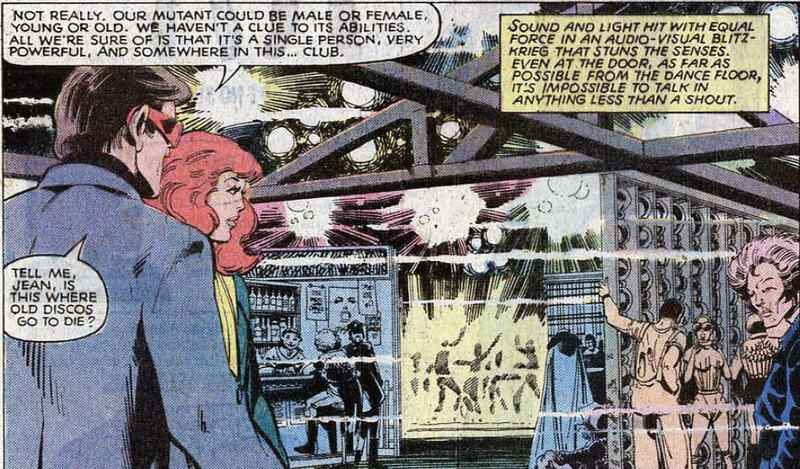 Just as a startled Phoenix attempts to explain, they are interrupted by the arrival on stage of the main act, a woman named Dazzler who creates her own fantastic lights and the new mutant for which they've been searching. 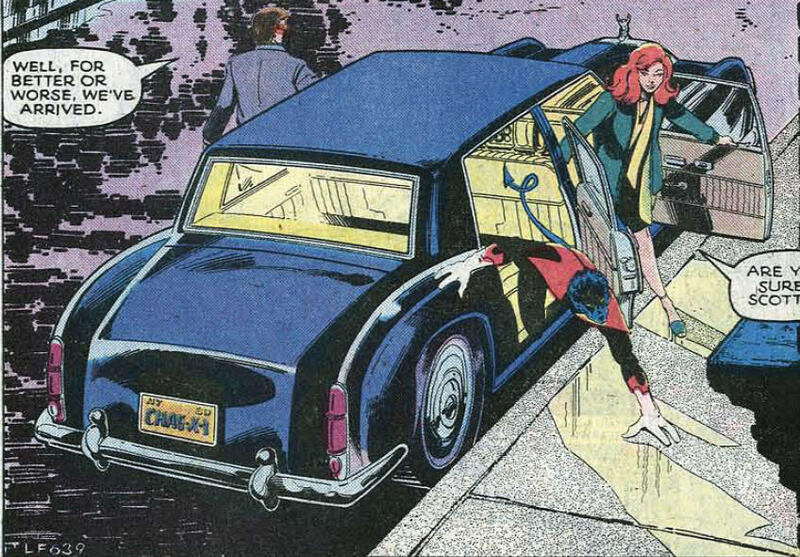 Outside, Nightcrawler answers the phone in the X-Men's car and hears Kitty's urgent plea for help, just as an armored Hellfire Club mercenary attacks him. Two more burst into the club, attacking Cyclops and Phoenix, but with Dazzler's help, they are able to defeat their armored foes. Nightcrawler tells Cyclops that the X-Men in Chicago have been captured. Cyclops tells Dazzler she is a mutant and asks her to accompany them for her own safety, figuring she is safer with the X-Men than on her own. The four depart to rescue the other X-Men, driving past a laughing Jason Wyngarde. 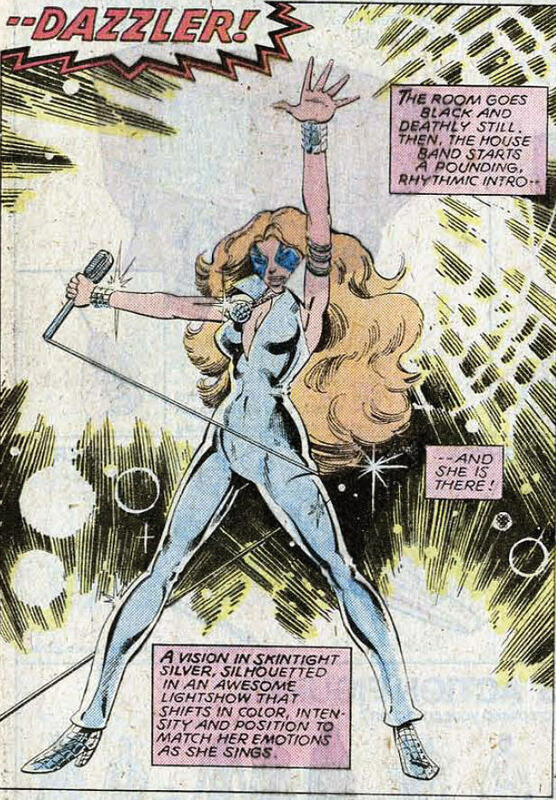 This is the first appearance of Dazzler (Alison Blaire), a mutant with the ability to convert sound into light energy. Shortly after this issue, she will receive her own series (which will run for nearly 40 issues) and, down the line, will end up joining the X-Men for an extended period of time before settling in as an off-and-on member of the team. Dazzler has a fairly convoluted creation story, as she was born of a partnership between Marvel and Casablanca Records to cash in on the disco craze. Initially, Casablanca approached Marvel and said, "create a disco-themed comic book character, and we'll create a live disco act to match it". That idea was eventually scrapped in favor of an animated movie featuring the character-who-would-become Dazzler and all the artists under Casablanca's control, such as Cher, Donna Summers, and Kiss. Marvel EiC Jim Shooter even wrote the film treatment for it. The animated film was then scrapped in favor of a live action film (Bo Derek was attached to it at one point). Though Marvel held up their end of the bargain and introduced "the Disco Dazzler" in their comics, none of the other multimedia elements from Casablanca Records ever saw fruition. Brian Cronin's Comic Book Legends Revealed column has covered the origins of Dazzler in some detail; read more about it here, here, and here. 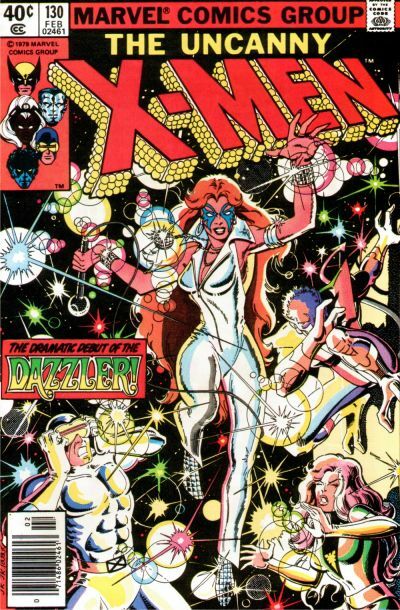 Dazzler's debut is notable for two other things. First, despite appearing in this issue, in the midst of their run, neither Claremont nor Byrne were involved in any way with the creation of the character; they were merely instructed to work her into the issue. Second, her later solo series was the very first comic book series to be sold exclusively to the direct market, that is, comic book specialty shops and not newsstands, drugstores, etc. (which were, at the time, the primary outlet for comic book books). Thus Dazzler's comic book series was a significant milestone in the history of the direct market that dominates the comic book industry today. 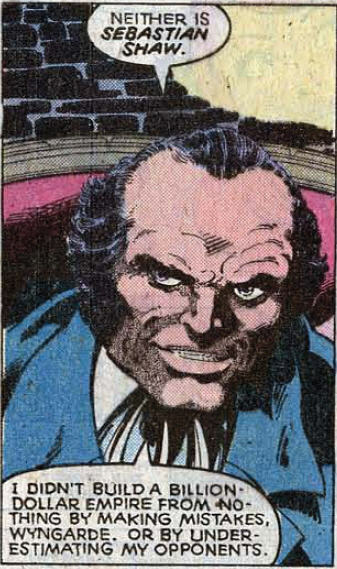 Sebastian Shaw, leader of the Hellfire Club, also makes his first full appearance in this issue (and has his first name revealed), after appearing in shadow last issue. The group of villains running the Hellfire Club are referred to as the "Inner Circle" for the first time, and the public face of the Hellfire Club itself is established, as "one of America's oldest, most exclusive gentlemen's clubs. It's membership list reads like a 'who's who' of the nation's social, political, and economical elite". 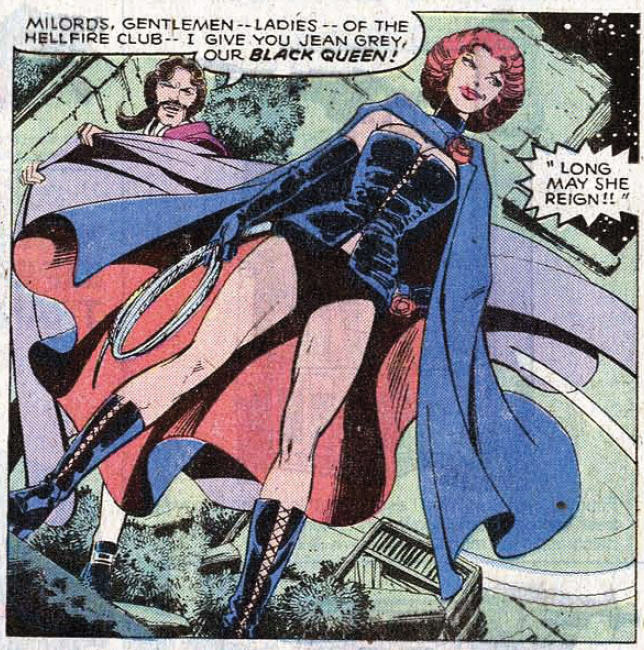 Jean experiences another time shift, finding herself back in the 18th Century and marrying Jason Wyngarde, after which she appears as the Black Queen of the Hellfire Club for the first time. 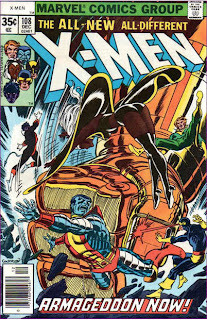 Future X-Men artist John Romita Jr. contributes his first work for the title, drawing the cover of this issue (he also designed Dazzler's costume). 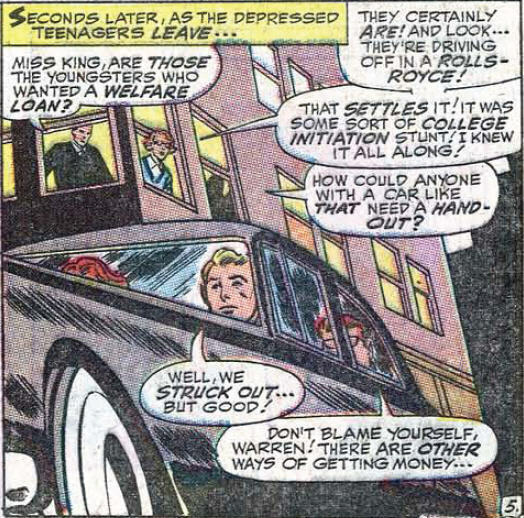 The X-Men's Rolls Royce returns, the very same one which once prevented them from receiving a welfare loan in order to fly to Europe to save Professor X! 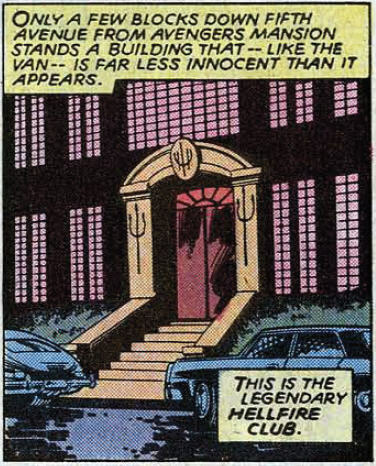 The Hellfire Club is revealed to be located on Fifth Avenue, just a few blocks down from Avengers Mansion. 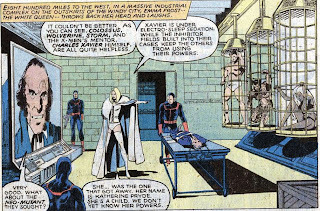 Having been stripped searched last issue, the underwear-clad X-Men are locked in cages with power inhibitors by the White Queen. 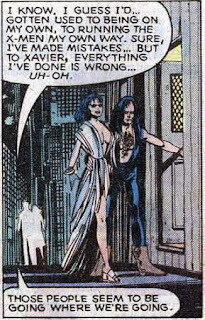 Despite having searched Storm's costume for lockpicks, the Hellfire Club goons missed a sewn-in tag with the X-Men's phone number on it, which Storm gives to Kitty to call for help. Professor X is shown to have been captured between issues. Jason Wyngarde's seduction of Jean reaches a new level this issue, as her actions in the time shift begin to be reflected in real life. Once again, Wyngarde casts a unique shadow. It's noted that Cyclops subconsciously recognizes it, but won't realize it for some time. In this issue, Wyngarde is referred to as a member of the Inner Circle; it will later be revealed he is merely an applicant to that body and not an official member. 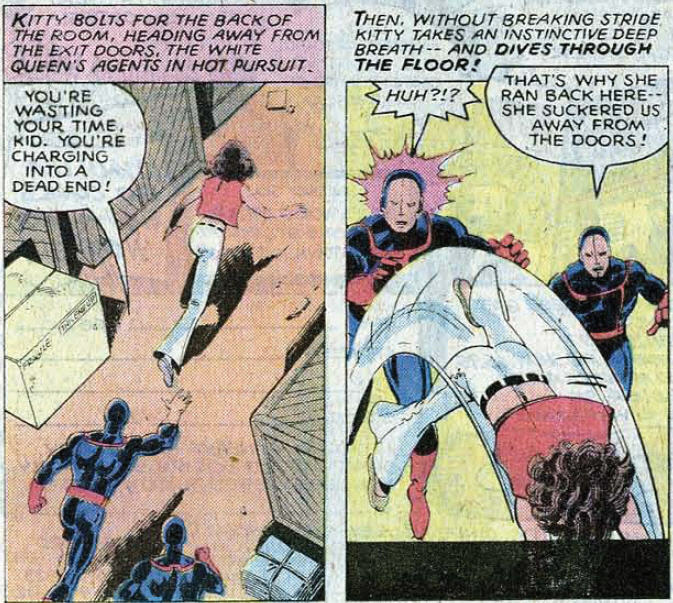 Dazzler bombards one of her opponents with so much light that he loses consciousness, a technique she refers to as "dazzling" him. I haven't read her ongoing series, but I'm fairly certain that specific technique is never used again when she pops back up in X-Men. Once they've entered the noisy club, Phoenix establishes a telepathic rapport with Cyclops so they can communicate without speaking. 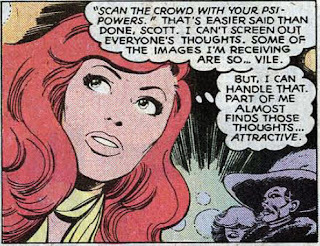 Phoenix picks up on a number of vile thoughts within the club, but part of herself "almost finds those thoughts...attractive". Cyclops has a mini Cerebro unit built into his watch. As Phoenix telekinetically transform her and Cyclops' street clothes into their costumes, Cyclops marvels at her power level (it's also a nifty a way to get the X-Men into costume without having them take the time to change their clothes). Once again, the Hellfire Club blows up its defeated goons. Dazzler refers to the armored Hellfire Club goons as "refugees from 'Starship Troopers'". Cyclops pulls that classic exposition trick to catch up readers of telling his teammates that they know something, then going on to explain to them exactly what it is they know. Cyclops' line, "is this where old discos go to die?" can be read as Claremont making a veiled reference to his feelings on the matter of being forced to shoehorn Marvel's "let's cash in on the success of disco!" character into the ongoing story. At the disco, one of the background club goers serves as Byrne's take on the Joker. For whatever reason, I've always liked this panel, where you get to see the goons inside the suits of armor still wearing their Hellfire Club mask. Cyclops notes that he's been edge since Professor X came back. Later, Nightcrawler says that Professor X was furious when he learned Nightcrawler is no longer using his image inducer. The letters column in this issue continues one of the first "we want to know more about Wolverine/leave Wolverine mysterious!" debates, and also calls for the end of his relationship with Jean, in light of the introduction of Mariko. "...Marvel decided they needed a disco character to cash in on the then-current craze, and that, since mutants were deemed popular, she should be a mutant. So Dazzler got shoehorned into Kitty's intro, with Chris and I having absolutely nothing to do with her creation. (And with everyone being told to ignore the fact that there was already an X-Men villain -- the guy who murdered Warren's father, fer chrissake!! -- called "Dazzler".)" "I will forever have people coming up to me and saying, 'So, you created Dazzler, right?' No! No! Dazzler was stuck in the middle of a two-part story that had to become a three part story because of her. I created Kitty Pryde, whose story that was meant to be, but I had nothing to do with Dazzler." Editorial edict forced Claremont and Byrne to work the introduction of Dazzler into their unfolding Dark Phoenix story, and once again their consummate skill and rapport at this stage of their collaboration makes the whole thing seem effortless (any indication that this wasn't part of their plan all along are fairly veiled) and, as Jason Powell discussed in his post on the issue, the edict actually has a fortuitous effect on the overall story. Initially, the first phase of the Hellfire Club's attack, featuring White Queen and Kitty, was only meant to last two issues, but the order to introduce Dazzler in #130 pushes that act of the larger story to three issues, thus making the entire Dark Phoenix saga last nine total issues, three acts of three issues each; a neat bit of symmetry. 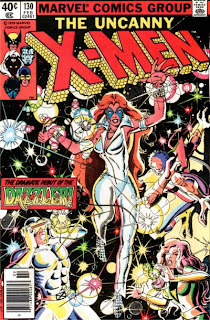 Though Dazzler, a character created by a committee of comic book creators and record executives, born of a quickly dying fad, initially isn't the most dynamic or intriguing character, she will slowly evolve over time, and eventually Claremont will take an interest in her and work her into the book, thus bringing her full circle with her otherwise-commercially mandated first appearance in X-Men. And while she will never quite reach the heights of her contemporaries Kitty Pryde or White Queen, she's certainly not the worst character to debut in the pages of X-Men. It's a psionic showdown as Phoenix faces off against the White Queen! Dazzler- she's always seemed a bit 'silly' to me for some reason. Also- how is she able to flood someone's soul with light? They went too far with that description methinks. @Anne: Dazzler- she's always seemed a bit 'silly' to me for some reason. Yeah, she definitely seems silly in these early appearances, but I like her a bit more once she actually joins the team, at which point she's not really wedded to the whole disco thing anymore. Also- how is she able to flood someone's soul with light? They went too far with that description methinks. Yeah, that almost went in "Claremontisms" as it's a bit overwrought, the kind of narration his critics like to lampoon, and while I'm willing to defend some of his purple prose, nowadays my eyes pretty much start rolling automatically as soon as they see the word "soul". I don't know that I'd go so far as "awesome" (it wouldn't make my list of powers I'd want personally, for example), but it's definitely a different power, and I like that. And I like the way that she manages to contribute on a team that's all about fighting bad guys with what is essentially a defensive power. This issue is interesing to me from a pop culture viewpoint. The "disco" looks more like a dingy punk rock club, and the patrons look like an amalgamation someone's idea of what punks and late 70s disco club goers look like. Having said that in 1980 I was way too young and not in NYC for any first hand knowledge. I like this version of Dazzler. I'm not sure why. I never really warmed up to her on the X-Men, but I love the super-cheesy "Disco Queen" version of the character. I love that Wyngarde is wearing his old-fashioned Hellfire Club clothes at the disco. I guess he wouldn't stick out among the gaudily-dressed patrons as illustrated, but it still seems funny. I believe Shaw usually "dressed down" in normal suits when outside the club, didn't he? Jim Shooter also wrote up his version of Dazzler's conception here: Debut of the Dazzler. It includes his full treatment for the movie in PDF format. "The Hellfire Club is revealed to be located on Fifth Avenue, just a few blocks down from Avengers Mansion." I've always liked that touch. It subtly reminded you that there are other superheroes in the world besides the X-Men, and it was just cool to think that a group of villains were living in plain sight, practically as neighbors to the Earth's mightiest heroes. "Once again, Wyngarde casts a unique shadow." Also, I still kind of get chills from the ominous narration noting that someday Cyclops will remember the shadow and realize who it belonged to, but by then it may be too late for him, for the woman he loves, etc. (Can't remember the exact wording, but it's something like that). "...the loss of his power left him so emasculated, he was reluctant to call Moira." Wow, I had no idea. As you say, it's not the best solution, but at least Claremont bothered to address it! @Chris: The "disco" looks more like a dingy punk rock club, and the patrons look like an amalgamation someone's idea of what punks and late 70s disco club goers look like. Yeah, the disco is definitely not at all how I picture discos from the late 70s, not that my picture is necessarily based at all on reality. One of the things Jason Powell comments on his post is the idea that the depiction of the disco as a seedy, rundown, punk-esque club might be more commentary from Claremont and/or Byrne regarding their feelings towards shoehorning Dazzler into the story. @Matt: I love that Wyngarde is wearing his old-fashioned Hellfire Club clothes at the disco. ... I believe Shaw usually "dressed down" in normal suits when outside the club, didn't he? Ha! I never even gave that a second thought, but it is kind of odd that the Wyngarde of 1980 at the club is dressed the same as the Wyngarde of 1780 in Phoenix's vision. And yeah, I'm pretty sure I remember seeing Shaw in meetings with Senator Kelly and whatnot dressed in normal clothes. it was just cool to think that a group of villains were living in plain sight, practically as neighbors to the Earth's mightiest heroes. Agreed. I've always thought it gave the Hellfire Club a little bit of added mystique, that they were villains, but villains capable of hiding in plain sight. Back when I read this for the first time, I immediately recognized the shadow. By the time I read this story for the first time, I already knew who Wyngarde was so that was always just a cool little detail for me. It must have been terribly fun for anyone reading it the first time to see that and recognize it, and know they picked up on one of the clues. Should I be avoiding spoilers for thirty year old stories that pretty much the entire comics reading community has read? I've intentionally been a little cagey with some of the details in these posts for the benefit of any readers who may not have read the storie yet, or who have forgotten some of the details (and it also makes it a little more fun for me (and maybe some of the readers who do know exactly what comes next) to try and recreate the feeling of reading these one at a time without knowing where they fit in the tapestry of X-history) but at the same time, it's not like I don't spoil, say, that Kitty Pryde or Dazzler will one day join the team, and I certainly can't begrudge any spoilers of, as you say, a 30 year old story that is also one of the seminal works of the genre. Yeah, I really like that closing bit as well (you pretty much nailed it, too). Discussions of Dazzler's light piercing someone's soul aside, Claremont really turns in some excellent narration throughout this story (there's a few lines from #137 that still choke me up every time I read them...). Claremont's narration specifically and the device in general is something that gets derided by a lot of modern fans, and I can't deny Claremont himself can overuse it, but there is something to be said for what really good narration can add to a comic book story. As you say, it's not the best solution, but at least Claremont bothered to address it! "...there is something to be said for what really good narration can add to a comic book story." I don't understand why third person omniscient narration is considered passe in comics, while first person narration is totally "hip and sophisticated". I can almost understand why people feel thought balloons aren't sophisticated, though I disagree with the sentiment... but first person narration boxes basically are thought balloons, for most intents and purposes! I find it especially silly when I'm reading a comic where two characters are first person narrating opposite one another. Why not just use thought balloons? Anyway -- my point is, if you're trying for sophistication, I feel like omniscient narration is more sophisticated than first person when done well, since it reads like a novel with pictures. But, that said, I should add that I don't necessarily look for sophistication in comics anyway. I want comics to be full of overblown purple narration, thought balloons, and sound effects! That's what makes them fun! "...Claremont didn't write that particular backup; it was Fabian Nicieza..."
Interesting. I wonder if he pitched it himself, or if editorial asked him to do it, or if Claremont suggested it but had no time to script it himself. The license plate on the Rolls Royce is "CHAS-X-1". Do we really think that the Professor Xavier of the comics (as opposed to the swingin' playa of this summer's X-Men: First Class film) would employ such a vanity plate? Not for the first time, I'm reminded of the curious coincidence of Charles Xavier / Professor X and the "Charlie X" episode of Star Trek, about a teen with mental abilities. They're laying it on a bit thick with Jason Wyngarde's shadow now. Also not for the first time, and related to the actual stories at hand, I find it hard to swallow that the Hellfire Club was carrying out villainous (or from its own perspective just selfish or power-grabbing, perhaps, but still illegal and surreptitious) activities under its own name and as seen in #129 with its logo emblazoned on an van full of armored goons all while purporting to be no more than an elite gentleman's club. That makes the secret identity of Captain America's young, brown-haired, domino-masked sidekick Bucky [Psst... He's really Pvt. Steve Rogers' young, brown-haired pal and regiment "mascot"... Bucky!!!] — look like a Mensa question. We're told that Jean Grey is "not even a quarter-century old". The lettercol in #124 remarked that the X-Men have been together for "five or six years ... if that," although in #98 Cyclops says that the new team has existed for "almost a year" and the last Sentinel attack was referenced as having occurred in 1969, with in-story and publishing time coinciding. I've noticed that the passage of real time in Marvel comics was held onto by some writers into the late 1970s, with Steve Englehart noting the Avengers' decade-plus existence contemporarily with Claremont's earlier real-time references in X-Men. Chances are that referencing the actual calendar — in terms of history, not the continuing Marvel hallmark of trying to be relevant to current events — depended on the writer (and I'm talking about overall passage of time, not compressed events or elongated downtime in or between individual stories; that actually helps smooth things out in the big picture just as with TV series). Matt: It includes his full treatment for the movie in PDF format. A friend of mine sent that to me a while back. How can I put this? It's professional only in the sense that he presumably got paid for it. @Matt: I can almost understand why people feel thought balloons aren't sophisticated, though I disagree with the sentiment... but first person narration boxes basically are thought balloons, for most intents and purposes! That's what drives me nuts, too. The first person narration box is just a thought bubble in a box. And if that's okay, why not the occasional third person narration? I want comics to be full of overblown purple narration, thought balloons, and sound effects! That's what makes them fun! Agreed. Though I'll add that I don't think those things and sophisticated comics are mutually exclusive. I wonder if he pitched it himself, or if editorial asked him to do it, or if Claremont suggested it but had no time to script it himself. That's a good question. I know Claremont stopped writing most of the backups a few issues ago (Classic X-Men-wise) but I have no idea why, whether he just got busy/bored, or if editorial wanted a new voice, or ??? @Blam: The license plate on the Rolls Royce is "CHAS-X-1". Thanks for pointing that out; I meant to and then it got lost in the shuffle of all the other stuff in this issue. You're right, though: that's definitely the kind of plate First Class Xavier would have. I find it hard to swallow that the Hellfire Club was carrying out villainous...activities under its own name and as seen in #129 with its logo emblazoned on an van full of armored goons all while purporting to be no more than an elite gentleman's club. Ha! I never thought of that, but you're absolutely right. Especially after we see this issue that the logo on the van last issue is exactly the same as the one on the outside of the club. There's hiding in plain sight, then there's...that. We're told that Jean Grey is "not even a quarter-century old". That was something else on which I meant to comment (it's a good thing I've got you guys around to pick up these dropped balls)! I definitely think you're correct about the writer being the arbiter of how time passes in the book. Englehart especially never seemed scared to adopt the "real time" approach to his work (plus, it was probably easier to keep track of time that way). Nowadays, it feels like there's either an editorial edict to the effect of "be vague about it" or, more likely, today's writers are just more conscious of the ongoing-ness (for lack of a better word...) of the characters and go out of their way to avoid explicitly pinning down a specific age or time. It's professional only in the sense that he presumably got paid for it. "...I don't think those things and sophisticated comics are mutually exclusive." I agree; I just phrased that poorly. I'm not averse to sophistication in comics, and I don't think the things I listed detract from it or prevent it, as many of today's writers and editors seem to believe. Regarding the "real time" thing -- as noted, some of Marvel's writers (Englehart being a big one) in the 70's observed it -- but others didn't, such as the Spider-Man writers, who had him in college throughout the entire decade. He did eventually graduate, though, and went into grad school, where Marv Wolfman intended him to stay forever, since as he has said, in real life, someone can actually be in grad school forever without raising any eyebrows. Claremont was someplace in between, I think. Near the beginning he was definitely observing real time, with the reference to 1969 in the Sentinels' dialogue, etc. But as we see going forward, he begins to apply the brakes. Kitty is 13.5 years old when we meet her, and she turns 14 in outer space around the 160's, basically 2.5 real-years later. She turns 15 in Excalibur a few years after that. Narration also notes in issue #145 (May 1981) that Storm has been an X-Man for three years, but she joined in issue #94 (August 1975), published almost six years before. So while real time might have been observed for the first couple years, Claremont has begun to slow it down, and has even disregarded his previous uses of it, with things like mentioning that Jean is less than 25 years old. 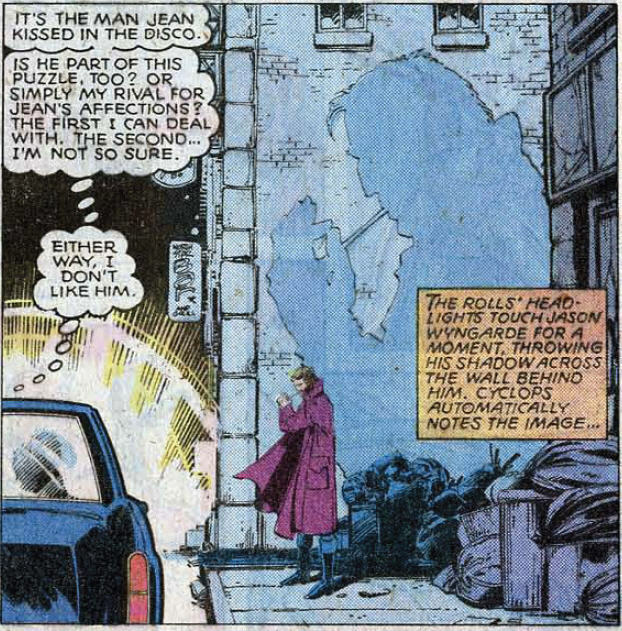 Jean's [spoiler]tombstone[/spoiler] in issue #138 is another instance of Claremont discarding real time. If she was born 1956, she certainly didn't join the X-Men in 1963, when their first issue was published! None of the above is meant to illustrate anything or support any theories... it's just a rambling encapsulation of some of the nerd thoughts that run through my brain on a daily basis. Seriously. I once drew out a "best guess" timeline of just how many years in Marvel Time I thought the X-Men had been active! Yeah, first person narrative is exactly the same as thought balloons. It's kind of dumb. I get that Watchmen was innovative and critically acclaimed and sophisticated and all that. But it wasn't just because it had no thought balloons. The style of that story lent itself to no thought balloons. But it doesn't mean any comic with thought balloons isn't good or sophisticated. Thought balloons and third person narratives are like any other literary device in history. It can be well done and affective if used correctly but stupid and childish when not. Yes, when a villain reveals themselves to be the hero's best friend, you probably don't need a thought balloon attached the hero's shocked face saying "I can't believe it's my best friend!" But still, thought ballons have their place...unless you want them to be first person narrative boxes, which are exactly the same thing. @Matt: Seriously. I once drew out a "best guess" timeline of just how many years in Marvel Time I thought the X-Men had been active! Not quite on the same level, but I still have my handwritten notes as to how I believe all the issues (including the spinoffs) fit together, from the beginning up to just after "Onslaught". I suppose I could make a case for top 10 (but not top 5: telekinesis, invulnerability, healing, flight, telepathy). @Dr. Bitz: Thought balloons and third person narratives are like any other literary device in history. It can be well done and affective if used correctly but stupid and childish when not. Indeed. To use your example, the "I can't believe it's my best friend!" thought is bad, regardless of whether it's expressed in a caption or a thought bubble. I'll give credit where credit is due -- Claremont and Byrne did an excellent job with Dazzler's intro and with this chapter of the Dark Phoenix saga in general, especially considering that it started as an editorial edict. Still, Dazzler never grew on me. Her early appearances and backstory are silly, but she remained two-dimensional ever after she joined the X-Men full time in the early-200s. 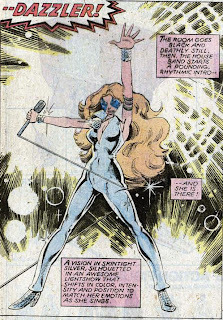 I can't recall a single Dazzler thought bubble that wasn't about how awesome singing was or about quitting superheroing and becoming a star again. Blah. Thank God nothing else became of the planned Dazzler multimedia experience. An early-80s movie about a superheroing disco diva starring Bo Derek? That would have been a disaster and probably would have ruined part of the Dark Phoenix reading experience for newer fans who read these as back issues. Just imagine -- action, angst, drama, one of the greatest hero-to-villain stories ever told and... WTF? Is that Bo Derek?! Also of note, the 90s X-Men animated series stayed pretty faithful to Claremont and Byrne's story for the TV adaptation. (Much moreso than they did for the Phoenix saga.) They even managed some shot-for-shot remakes of some class Byrne / Wolverine scenes. But one thing that always bothered me is that they kicked off their story with a Dazzler episode instead of Kitty. Not only did it make the whole Dark Phoenix TV storyline feel rushed at the beginning, but it means that Kitty never appeared in the animated series, while B-list X-Men like Dazzler and C-list villains like Zaladane got multi-episode arcs. So weird. @Michael: Claremont and Byrne did an excellent job with Dazzler's intro and with this chapter of the Dark Phoenix saga in general, especially considering that it started as an editorial edict. Yeah, they really rolled with that particular punch quite well. I read the story for years without every knowing they were forced to work Dazzler into it. I can't recall a single Dazzler thought bubble that wasn't about how awesome singing was or about quitting superheroing and becoming a star again. The only thing I can (kinda) counter that with off the top of my head is her rivalry with Rogue during the Outback years, but really, that just amounted to a third thought bubble dealing with jealousy over Longshot. ...it means that Kitty never appeared in the animated series, while B-list X-Men like Dazzler and C-list villains like Zaladane got multi-episode arcs. So weird. That is weird, and I'm actually ashamed that I never realized until I read your comment that Kitty never appeared in the animated series. I'd call it the "Excalibur effect", but they managed to work in Nightcrawler. Maybe the "Jubilee effect", cuz they already had their neophyte POV character? No matter what, like you said, for all the crap characters to which they devoted time, ignoring a fairly significant members of the team is bizarre. That said, I've always been impressed with how well the show adapted "DPS", especially considering Fox's standards for animation at the time and the comparatively risque material (like the Hellfire Club attire). I gotta stick up for Dazzler. Where as all the other X-Men wanted to be heroes, Ali wanted to do something else with her life. Besides Wolverine and his infinite lost weekends, what do the X-Men want to do with their lives? In a lot of ways she is the opposite of Betsy, who wanted to be an action junky. love this site. we oft-times use it for references for our podcast covering the CC X-Men run. Check it out if you get a chance. @Matt R.: love this site. we oft-times use it for references for our podcast covering the CC X-Men run. Check it out if you get a chance. Thanks! I'll have to check out your show sometime - I'm always on the lookout for another good X-Men podcast. "Wolverine and his infinite lost weekends"
This reply is 3 years late, but this hilarious and accurate description of Wolverine's solo stories deserves some recognition. As someone born two years after disco died the final death, it took me eons to warm up to Dazzler. I was first introduced to her in the 1990s X-Men arcade game, having read "X-Men vs. Dracula!" beforehand and been introduce to Colossus, Nightcrawler, and Kitty through that, and the rest coming into my consciousness via the animated series. Dazzler has an exceptional power that seems like it should be a field day for any artist with an ounce of creativity to draw. 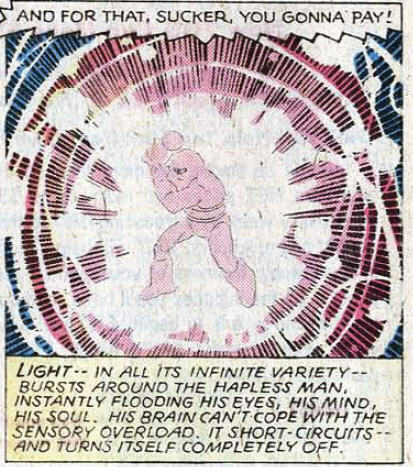 Byrne certainly seemed to be enjoying himself drawing the "dazzle-burst" scenes, with light and color exploding around an enemy till they pass out from sensory overload. In later eras, Wyndsor-Smith would continue the trend of chaotic, psychedelic light flashes (mid-screwy visuals, as is his wont), Alan Davis would draw bubbles, "light-smoke", and the trademark starburst, and Marc Silvestri couldn't seem to go two panels without giving Alison some sparkles around herself. For my money, SIlvestri draws my favorite Dazzler. The Pat Benatar-esque short cut makes her look like a proper Action Girl, her lights are drawn with a ton of neat effects, and her lasers actually look like they pack some punch, even as she strikes some ridiculous poses while firing them.. But writing-wise? I think writing Dazzler stories is a challenge. Claremont turned her into another Claremazon -- that is to say, an emotionally scarred Action Girl -- though when she and Havok were on the team together, I did enjoy the friendly rivalry they shared as the team's two long-range blasters. Alison would always come out on top thanks to her precision and fine control, which I thought was neat. However, Claremont gave her an obsession with "glamour & glitter, fashion & fame" (to quote another singer with a light-based gimmick) as an identifying trait. It really didn't serve to make her the most sympathetic of characters. Sadly, outside of Claremont, I haven't read enough other takes on Dazzler to really form an opinion of her as a character beyond his take. Other writers have done some interesting stuff with her...Fraction's "this city is a symphony and I'm her speaker" quote is one of the best lines she's ever delivered...but it's never been more than a scene or two, tops. I'd really like Dazzler to be taken seriously enough to stand as a member of the team again. Or alternatively, break off fom the X-Men and start another solo book with a focus on "mutant sub-culture". This concept was explored by Morrison, but Dazzler's place in it was never explicitly stated, which is sad. I feel that i the modern day, Dazzler should be the mutant equivalent of Ella Fitzgerald in terms of cultural impact, the first openly mutant performer. At the very least let the public perception of her take on a Weather Girls-esque camp factor. Just do SOMETHING with that side of her. This was the second-ever issue of X-Men I ever read (in the form of Classic X-Men 36) ... I was 9, and familiar with most of the characters from the "Pryde of the X-MEN" pilot, except Jean. I loved right off the bat, thanks to the Hellfire goon exposition, I knew who Jean was, what her powers were, that she used to be called Marvel Girl ... I felt caught up on 20 years of history in one fell swoop. By the way, check out the cover of the reprint of this in XMC 36 if you haven't yet, it's gorgeous. @Teebore: I definitely think you're correct about the writer being the arbiter of how time passes in the book. Englehart especially never seemed scared to adopt the "real time" approach to his work (plus, it was probably easier to keep track of time that way). See this is the thing about Englehart, Thomas, and early Claremont, that they were trying to convey Marvel time as happening in real time, when clearly it wasn't. The writers had a hard time it seemed with the whole "shared universe has to share a timeline" thing. For example, by the time Claremont in '76 was referencing the last Sentinel attack as "1969", you had a Spider-Man who graduated high school in 1965 who was only on track to graduate college in 1978 comics ... and if most of the original X-Men (As well as the Human Torch and Crystal) were roughly the same age as Peter Parker, then of course Jean is less than 25 in 1976 ... not to mention you have Franklin Richards, born in '68, only being portrayed as a toddler in '76 (that jives w/ Peter still being college aged). There are other timeline checkpoints too, like Wasp turning 23 at roughly the same time Peter is a college freshman ... but then Thomas and Englehart kept insisting the Avengers was happening in real-time, so you have Wasp perpetually being written like she's 40. Fortunately I think the introduction of the explicitly 13-year-old Kitty helps, because now Marvel had three timeline markers (Kitty, Franklin, Parker's schooling) to keep the timeline more or less in synch from this point on. Although later writers make mistakes too. Nicieza at one point claims the beast is 30 when there's no way he can be 30 yet ... but then again Nicieza got a few other things wrong too (as much as I love him as a writer).